When teachers are underpaid and schools are underserved, why do we pay veterans to encourage young students to join the military? On a Wednesday afternoon last month, a group of gray-haired women with canes and Styrofoam guns lined the streets outside the New York City Department of Education’s headquarters in Brooklyn. “Get the military out of our schools!” they shouted, capturing pedestrians’ attention. “No more JROTC!” These were the courageous women of the Granny Peace Brigade, and they were there to protest what they see as the militarization of the city’s public schools. In his proposed budget for the next fiscal year, Mayor Bill de Blasio allocates some $1.6 million to fund Junior Reserve Officers’ Training Corps programs in high schools across the city. Under the program, schools pay retired veterans to teach a military-oriented curriculum approved by the Department of Defense (DOD). If a student decides to enroll, the JROTC class fills a period just like any other; it is incorporated into her daily schedule, and the student receives credit upon successful completion. 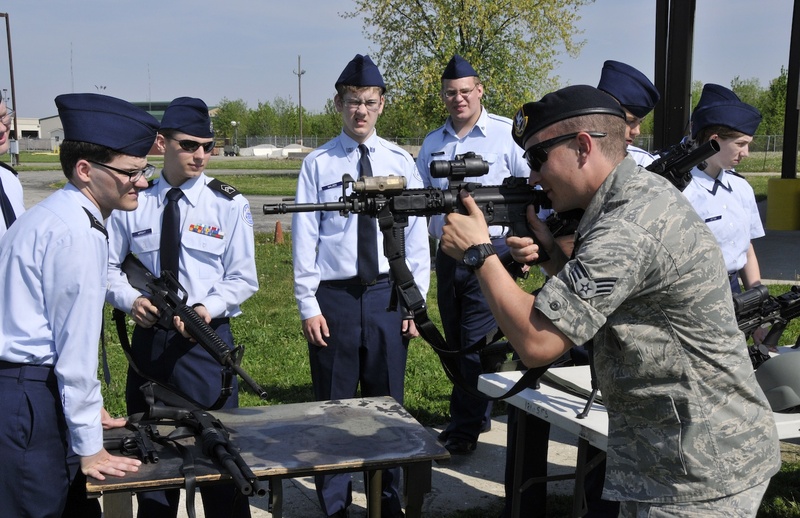 Instruction may vary by school, but activities often include inspections, physical exercises, discussion of military-approved textbooks, exams, and lessons prepared by the instructor. Some programs may also require students to dedicate their after-school hours to practice marching and shooting—activities that often occur on the school’s grounds. Nationwide, the costs of JROTC are even more startling. A 2004 study by the American Friends Service Committee found that schools across the United States were spending $222 million annually on JROTC instructor salaries alone. The DOD funds the rest of the program’s expenses: In 2013, that amounted to another $365 million. JROTC programs and military recruitment are strongest in poor and rural communities. In addition to JROTC programs, the military has also become more aggressive in recruiting youth to join the military outright. As part of 2001’s No Child Left Behind Act, public schools were required to give the military the same access to students afforded to college recruiters. They were also strongly encouraged to give the military access to students’ personal contact information upon request. Schools that failed to comply would risk losing federal funds. Military recruiters—who are distinct from JROTC instructors—are allowed to roam high schools at will and prompt students to consider a career in the military. Touting the benefits and “educating” students on the importance of service have become the primary strategies that recruiters use to persuade young men and women to enlist. They emphasize themes like glory, honor, courage, purpose, and sacrifice, but it is often the promise of free college, stable employment, career development, healthcare, life insurance, and upward mobility that persuade people to sign on the dotted line. Although JROTC claims to be separate from recruitment and exists “to motivate young people to be better citizens” (according to the Army’s official JROTC website), the textbooks used in classes specifically promote the military as a career option and mold young participants to adopt the ideals, perspectives, and attitudes needed to serve in the military. The program’s methods have proven quite effective: An estimated 40 percent of students enrolled in JROTC programs decide to enlist in the military after graduation. One of those people was Sabrina Waller. On the day in March 1998 that she learned her father had killed another gang member as an act of retaliation, Waller decided she couldn’t stay in Chicago any longer. Due to financial constraints, receiving a college education seemed out of reach, but, in fact, no one had ever told her about the possibility of qualifying for financial aid. Although she had no interest in JROTC or the military during her high-school years, she was desperate for any solution that would remove her from the cycle of poverty and violence around her home. It was during this time a friend convinced her to join the Navy. “The military will take you away from Chicago,” she recalls him saying. “You’ll live a new life and be around new people.” She enlisted two weeks after the incident and the following year was sent to Kosovo. She was 21 years old. As a plane captain in training, Waller helped maintain Navy planes on the flight deck of aircraft carriers. She witnessed the jets carrying 500-pound bombs in their bellies before taking flight; without exception, they came back empty. “You can’t return to the ship with a bomb,” Waller explains. “It’s too dangerous to land.” The bombs had to be dispatched even without an enemy target to drop them on. Occasionally, she would see videos of the aftermath. One particular instance has stuck with her: A bomb was intentionally dropped on a truck crossing a bridge in enemy territory, obliterating the vehicle and everyone in it. When Waller began to question these tactics and worried that innocent lives were unjustly being destroyed, her senior shipmates ignored her pleas. “I was told to shut up and not question things and just do my job,” Waller recalls. She now suffers from leg injuries and a neurological disorder causing daily migraines so overpowering they prevent her from living a normal life. But it is the moral pain that has been the most damaging for her. “There’s blood on my hands,” she says. “I don’t think that if people fully understood what it’s like to be in war, they would choose to go,” observes Rick Jahnkow of YANO. His organization focuses on presenting students with other options suited for their career interests, including non-military opportunities to receive financial aid toward higher education. “We want them to consider whether engaging in those activities is justification for getting financial aid through the military,” he adds. That doesn’t have to be the case, she tells any young person who will listen. As part of the group Veterans for Peace, Waller looks for opportunities to speak in classrooms around Chicago. These can be rare, however, as many teachers are reluctant to offer students a perspective that doesn’t align with the conventional honor-and-glory narrative of military service. Joyce ChuTwitterJoyce Chu is a human rights activist and an editorial intern at The Nation.